Flange fittings are a necessary evil for the industrial plumber. Without them, the connection of lines and plant equipment such as chillers, filters, control valves and backflow preventers are a nightmare – especially if ready access is unavailable to any component for installation or maintenance. A new and easier way of fitting flanged equipment is always welcome. The CTS Copper Companion Flange, a fully floating flange, is such a logical development in copper tube installation that it is hard to believe that no one has thought of it before. The concept is very simple. 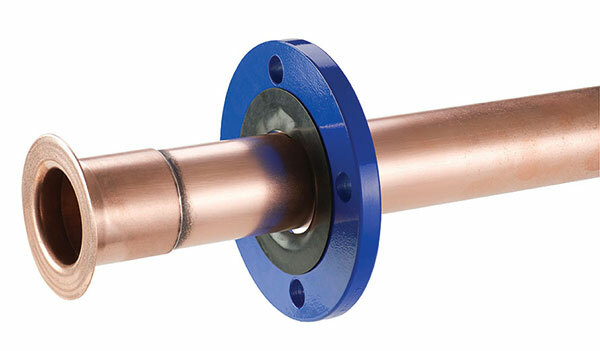 Instead of having to install a brass companion flange that requires careful alignment of bolt holes during brazing, the CTS Copper Companion Flange uses a copper fitting brazed/soldered directly to the copper tube, backed by a fully floating powder coated steel flange fitted with a neoprene insulator. The integral insulator allows the CTS flange to offer 100% protection against electrolysis. The cost of installing the CTS Copper Companion Flange is much lower. The brazing time required to complete a satisfactory joint between the Copper Companion Flange and the tube is up to 20% less than the brazing time required to attach a bronze flange. The time needed to align the bronze flange with its opposing fitting is eliminated totally. The fully floating CTS steel backing flange can be rotated freely around the joint to match a fixed flange on installed equipment without using force. The CTS Copper Companion Flange functional efficiency is enhanced by features such as automatic central positioning of the flange due to the unique design of the neoprene insulator, which ensures a positive seal. CTS Flange eliminates the requirement for bolt installation kits needed to prevent electrolysis between companion flanges and associated steel or iron valves and equipment. CTS Flange is also available for copper roll groove applications. Dramatic time savings with preheating and cool down time reduced.